The celebration in the Philippines was marked by a short program at SM Mall of Asia and a walk from the mall up to the scenic MOA Globe. ASP was represented by the National Office and members of Makati, Pasay, Novaliches, Paranaque, UP CAMP, and Tandang Sora chapters -- comprising the largest contingent. Talk N’ Text players, Jimmy Alapag and Harvey Carey joined the participants in the walk, eliciting smiles from their fans. 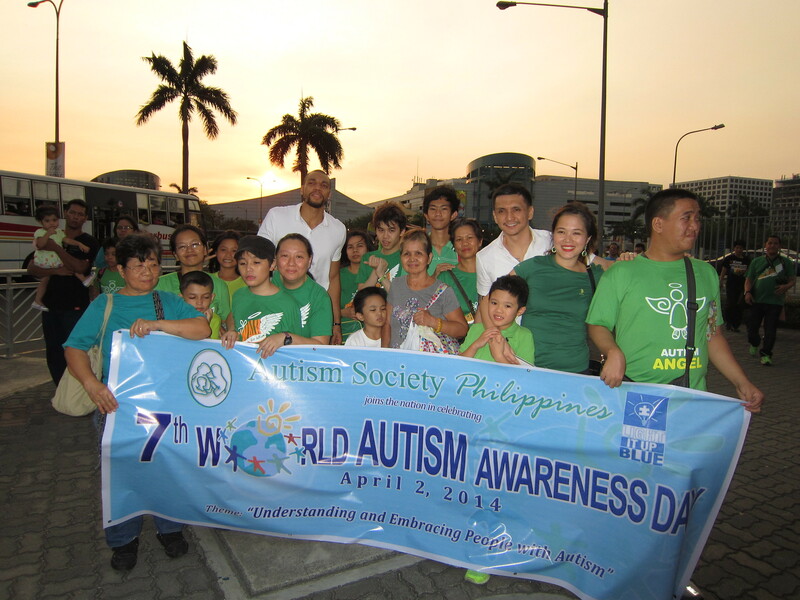 FIBA World Cup-bound Smart Gilas Team, Alapag posted in his Instagram account his message: “@jalapag3 Honored to be a part of the 7th World Autism Awareness Day today at Mall of Asia. #LightItUpBlue”. The highlight of the night was the lighting of the scenic MOA Globe in blue, similar to other scenic places around the world. The participants erupted in cheers. When asked how they felt lighting up the MOA Globe in blue, four mothers of PWAs said that it symbolizes unity. “My emotion was raised to the fullest when the globe was lighted showing the different government agencies, organizations and sectors involve in upholding the rights of PWAs,” says Ciony Torralba, a mother of Patrick and Secretary of ASP Tandang Sora. “The most awaited moment, the lighting of the MOA Globe brought unexplained joy to the hearts of the people who witness the event, specially to the families of PWAs, because from that moment on, we knew that people would begin to really took notice, and care about the plight of Persons with Autism,” added Mrs. Cristobal. “Masaya at napakaganda ng globe nang mailawan na. Salamat sa pagkakaisa ng mga ASP members,” said ASP member Benigna Nava. “Nakakatuwa na bukod sa ASP, meron pang ibang grupo na tumutulong para ipaalam sa mundo na mayrong ganitong komunidad (autism) na dapat irespeto. Sana dumami pa ang grupo ang magkaroon ng malasakit, lalo government,” ASP member Delia Panti observed. DIWA Partylist Representative, Emmeline Aglipay, a sibling to a PWA, addressed the advocates: “People with autism can change the world. People with autism can live lives full of hardship. People with autism can cover every point in between extremes. It's important for people to know that there are many types of people with autism, that each of them is an individual who is not and cannot be defined by a label." “You’re not a lesser kind of person if you have autism, you’re not a worse kind of person if you have autism — you’re just different, and while it’s always challenging to stand out in society, to not be the same as most people, it doesn’t mean that you are capable of any less than someone who is quote-unquote “normal,” she added.